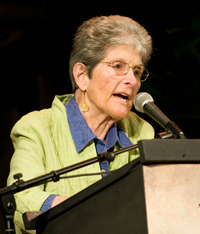 Maxine Kumin was born in 1925 and lives on a horse farm in rural New Hampshire. She has published sixteen collections of poetry as well as numerous books for children, four of which were co-written with the poet Anne Sexton. Kumin won the 1973 Pulitzer Prize for Poetry for Up Country, and served as U.S. Poet Laureate from 1981-1982. Three new books by Kumin are forthcoming in the spring of 2010: Where I Live: New & Selected Poems 1990-2010; The Roots of Things: Essays; and What Color is Caesar?, a book for children. This recording is available for noncommercial and educational use only. All rights belong to the author. © 2010 Maxine Kumin. Used with permission from Maxine Kumin. Thanks for Maxine’s voice. I enjoyed a reading by her in the mid to late 70s at Hamlin College, St. Paul,MN.